Adventures with Western Waters is the original outfitter of whitewater rafting through the famed Alberton Gorge. Our experienced staff will provide a fun and safe experience for people of all ages! Rafting the Clark Fork is considered to be the best whitewater rafting in the state. We offer exciting day long rafting trips filled with class II and III whitewater rapids, and our guided fly fishing trips on the Blackfoot, Bitterroot, and Clark Fork Rivers can be enjoyed for a half day or a full day. We are constantly told we have the best lunches on the river. The ingredients, the handmadeness... all within 15 miles of the raft shop. We include fresh garden grown produce and our famous pickled green beans to make your delicious river adventure unforgettable. Whitewater rafting Missoula and the Alberton Gorge Clark Fork River couldn't be better when you are in small boats, (high end sport rafts) not large ones crowded with tons of people high on groupon deals. Our customers come back because we hire great personalities, local river kids that know the area, and staff that are passionate about what they do. We pay them what they deserve. Some of them have been with us for almost a decade before. 40 years of guiding experience under our belts has given us a reputation as the most knowledgeable guides for fly fishing in Montana (Outfitter #10749). We track the river flows, follow the hatches, and understand how the wild and unpredictable weather affects our rivers and streams. We pride ourselves on being true Western Montana natives. Western Water's offers full day and half day trips on the Clark Fork, Blackfoot, Bitterroot, and Western Montana rivers where we employ drift boats or rafts outfitted to navigate these rivers. The rivers are noted for Rainbow, Cutthroat, Brown and Bull trout, while neighboring forest banks provide views of deer, elk, beaver, osprey, eagles, kingfisher, geese, and the occasional moose. Whether you are an avid fly fisherman or a novice seeking a new way to spend time in the great outdoors, our guides will suit your needs! Come join us for a guided fly fishing Montana trip! We have guides for spin fishing and fly fishing. Our shop is located on the river at Cyr, MT exit off of I-90, 25 min. outside of Missoula. We offer 5 styles of trips with an option to upgrade to a combo white water/fishing trip on the Clark Fork. Our company is owned by locals Jared and Sara Forsythe. Jared has been guiding and fishing in the area since he was 22. Sara is local celebrity who started the Zootown Arts Community Center in Missoula. Western Waters is a family affair and has been in the Forsythe name for 15 years now. Our shop is right at the put in for the trip. This means you don't have to ride in a bus with a bunch of crazy people. We employ local guides to make your trip authentic. Our Motto: Providing good times....with a sense of responsibility - which we take to heart. Start planning your vacation. Check out our Travel Guide for must-see adventures, places to stay, upcoming events and much more. Great news! We received your order and have you on the list for our next newsletter. Boo! Something bad happened and we weren't able to add you to our list. Start planning your vacation. Get our newsletter for must-see adventures, exclusive deals, upcomming events and much more. 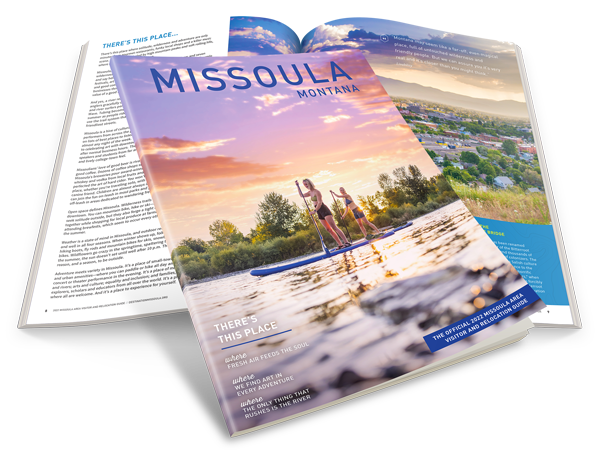 Begin creating your dream vacation to Missoula, Montana with Destination Missoula's travel planner.